Good news, friends of the Edgeworld! If you’ve caught up on the first two Dakota Frost books and want to try the third, you’re in luck – the Kindle edition of LIQUID FIRE is on sale for $1.99 through the end of the month! Will our lonely tattooed heroine finally find a girlfriend? Will her daughter finally get recognition for her mathematical skill? 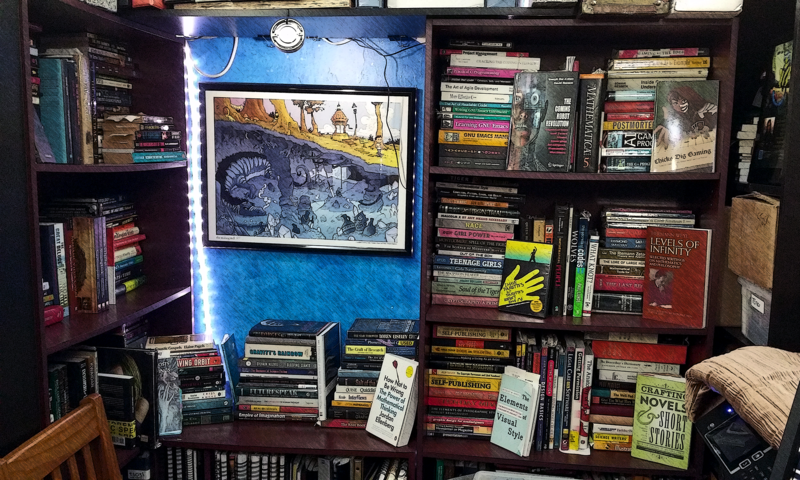 And will the ancient cadre of wizards out to rule the world let them have a free minute to enjoy a frappe at their favorite bookstore … or will they find themselves fighting fire ninjas to the death in a struggle for control of the spirit of a hatching dragon? 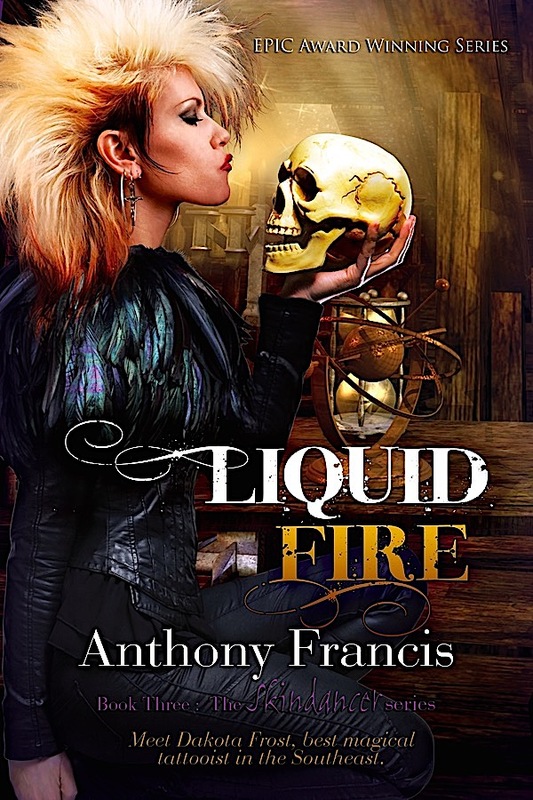 Read LIQUID FIRE and you’ll find out! Viiictory! 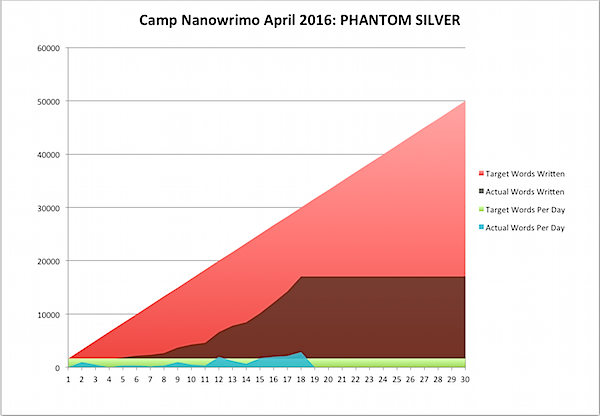 I successfully completed Nanowrimo for the fourteenth time – adding 50,000 words to PHANTOM SILVER, Dakota Frost #5. And, by working hard, I did it! 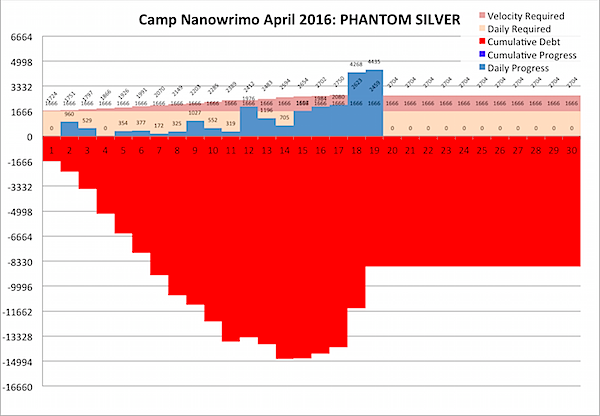 Because of work, life, and other writing, I got behind early this month, and had to press hard to really make it. But I successfully got it off my plate one day early. 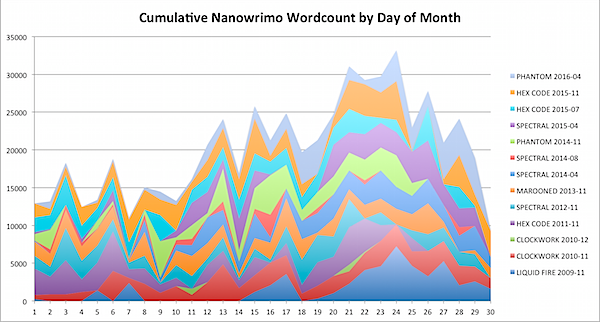 Because Nano’s site counts words differently than Microsoft Word, I had to push a bit past my Word word count, and so saw something I rarely see on this graph: a negative velocity debt, meaning I could write backwards and still end up finishing the count (at least the Word count) exactly on time. For a bit late in the month, especially around the 26th, it was as bad as I’ve ever gotten it: 6000+ words behind only 5 days from the end of the month. 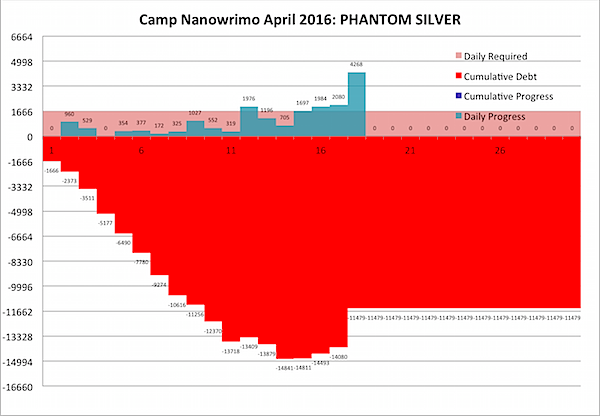 But somehow I managed to pull it out, setting a couple of daily records on writing … though I never even came close to my absolute max writing rate of 7,000 words a day. 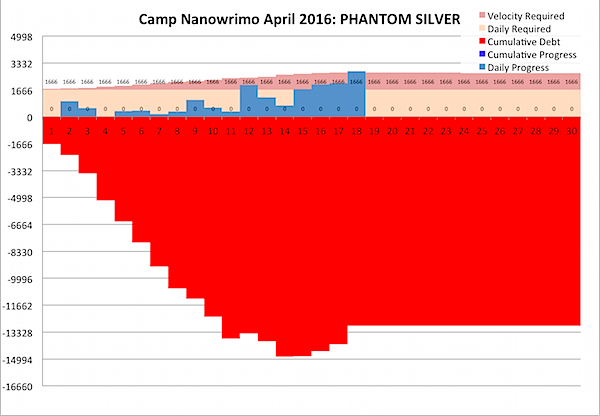 Strangely, even though Camp Nano doesn’t have November’s holidays, it still works out that most of the writing gets done near the end of the month. Go figure. Alright, late, tired, going to bed, more commentary later. 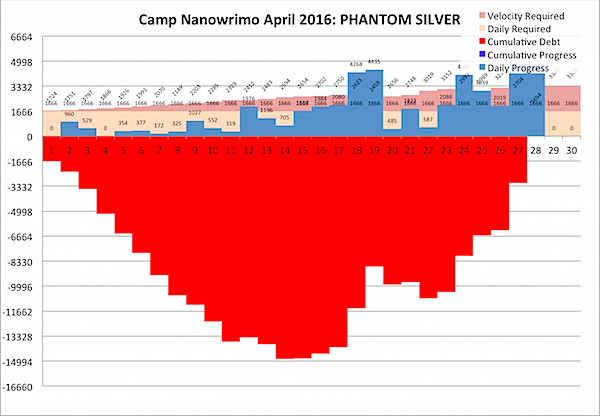 So after catching up for a while on Camp Nano, I fell behind again … because I and my wife traveled back to Greenville, South Carolina to assist my mother’s rehab from knee surgery, and frankly that’ more important than any amount of word count. 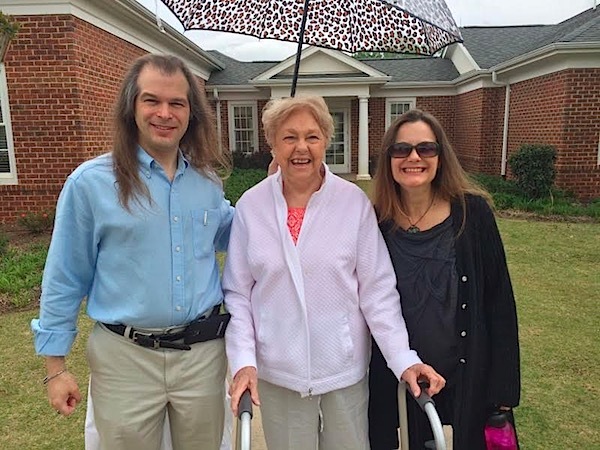 The good news is, she’s doing very well, and came home from the hospital yesterday … the even better news is, that my wife and my mom patched it up after eight years of not speaking to each other, a feat which I didn’t think was even possible. What a wonderful trip! 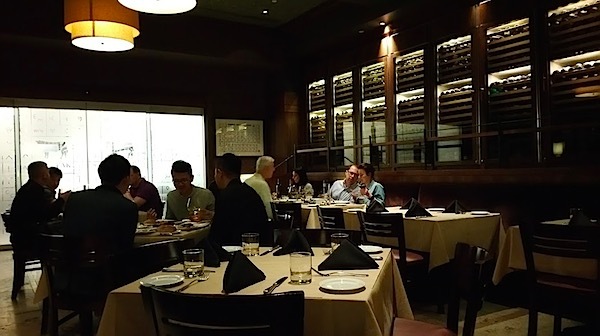 I lost my momentum the moment I hopped on that plane, and after that it was tough to get it back when I was caring for Mom – you can see the dent in the schedule around the 20th – and getting back on track after that required a full court press. 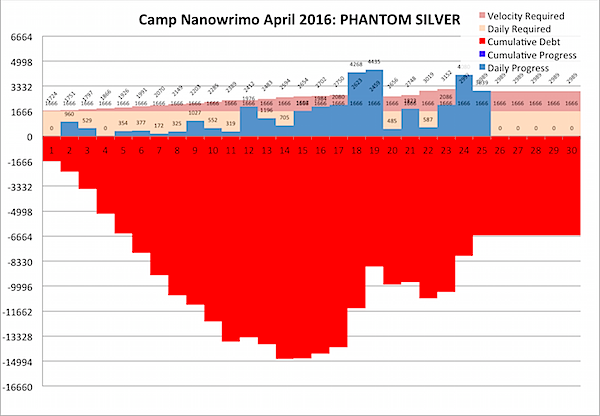 But, in the past several days, I was able to do just that, and managed to pump out 2000+ words on all of the past five days, and double that on three of those. As of tonight, I am caught up. As for now, there’s two days left, which I could tackle at a normal pace—though I’ll likely try to finish by Friday so that I can chill out on Saturday and have a nice relaxing weekend. Er … well, no we haven’t, but it’s still clearly possible. More news in a bit. I was literally dreaming all night about the chapter I wrote today – I got up several times with tears in my eyes, as one of Dakota’s enemies unexpectedly turned into one of her strongest allies. Fascinating what a fictional world can do to you. But the upshot is, I got 4,000 words done for two days in a row … and have a clear path for what I need to write tomorrow. We may win this one yet! Assuming I survive this weekend’s craziness! 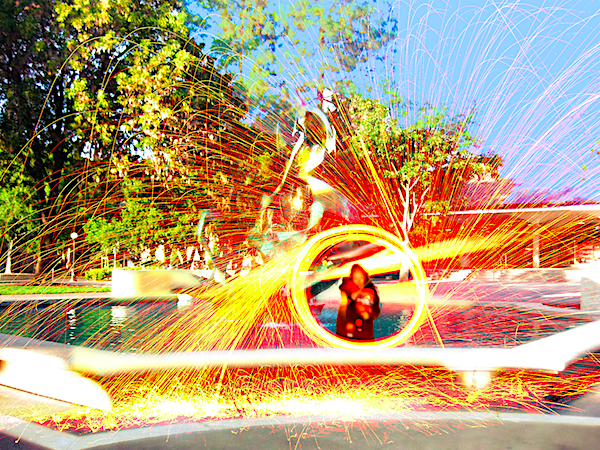 Which I can’t tell you about, but … aaaa! 4200 words today! Keep that up for 3 more days, I’ll be more or less back on track. 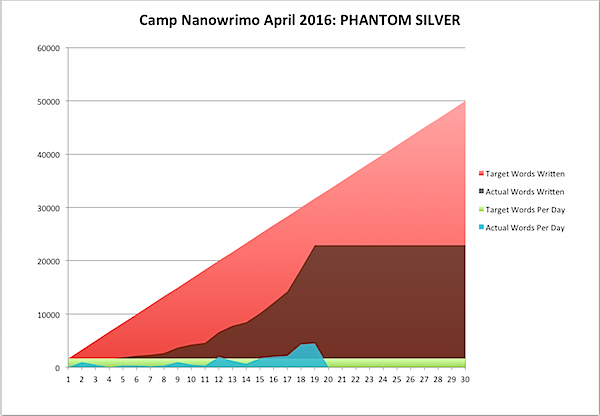 And then I’ll still have 18,000 words left to write this month. AAAAA! 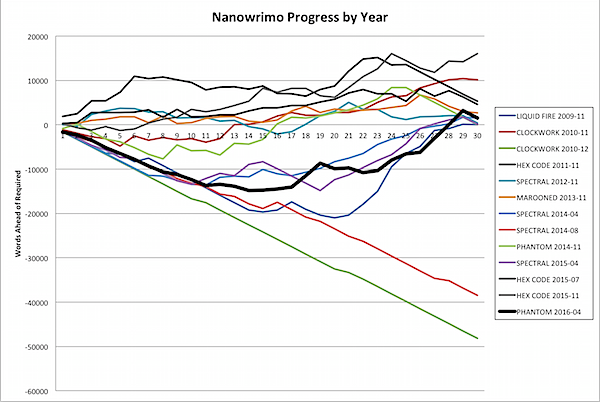 Is the novel back on track? NO. But am I up to speed? YES. Of course, I know I’ll lose more days, so really, to finish, I’m going to need to do even more than the—hork!—2750 words per day that my spreadsheet predicts I’ll need to do to get back on track. But I’ve gotten a much better groove, the story is starting to dovetail nicely, and some sections which felt out of place have, after a few moves, found a nice home in the story. The rocket is taking off, but there’s a long climb ahead. “Well … yes,” Avenix said. “I am not lying to you,” Avenix said. “Not likely,” Avenix said, shuddering. “Save it! 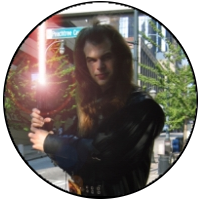 She has a real bad attitude,” I said, “but she’s pretty damn inoffensive for an alleged apocalyptic horror, and I’ve seen you in action against witchhunters! You can’t expect me to believe you’re all playing nice just because I came along! Sounds like Dakota and Avenix are going to have it out. Onward! 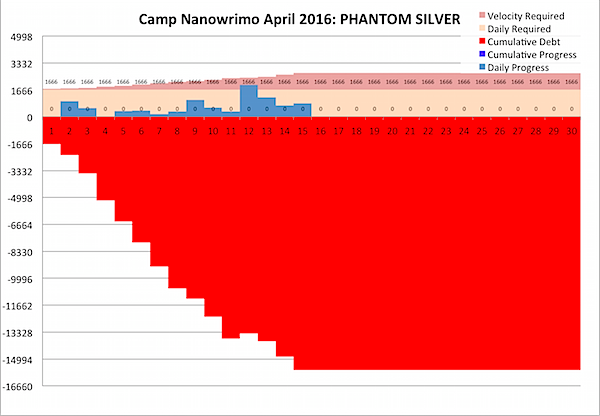 Several times in the past few days, I’ve finally gotten up to speed on Camp Nanowrimo. 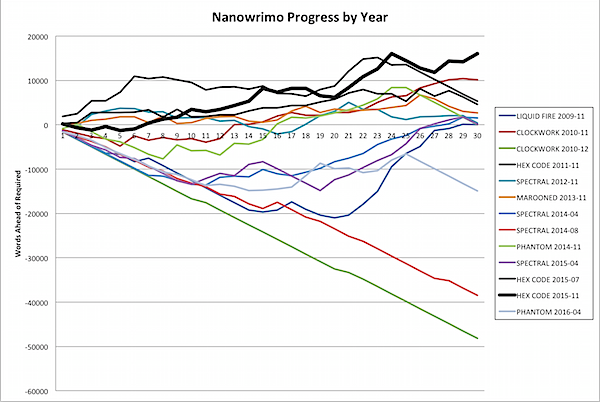 Only problem is, because I got so far behind, I need to go 50% faster than I’m already doing … and to catch up this weekend, even if such a thing was possible, I’d have to write eight times as much as I’ve already written today. Aaaa! … to how I made so little progress yesterday: halfway through yesterday’s writing session, I started entering yesterday’s wordcount into today’s row of the spreadsheet, effectively cutting my apparent wordcount for the day in half. No excerpts; I just experimented with a new chapter 1 and I want to try it on for size before I share it. 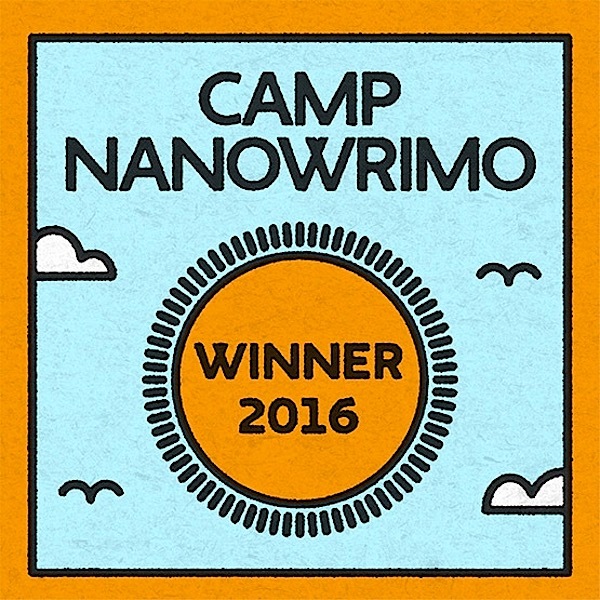 But it seems to dovetail nicely with what I’ve already written … and it was 800 free words, springing fully formed from my pen, uh, keyboard.